Take your entertainment to a new level with LGs 4K Upscaler and HEVC decoder for 4K streaming. 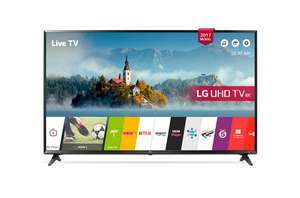 The award winning LG Smart TV with Freeview Play : Enjoy catch-up TV from BBC iPlayer, ITV Hub, All 4 and Demand5, as well as movies and box sets on demand from Netflix, Amazon Video and NOW TV. how is this compared to LG 49UJ701V? Beware this TV has poor viewing angles. If you're not sat right in front & in line, you'll see picture go quite dark & uneven lighting across TV. Some motion blur on 4k too - Returned mine. Beware this TV has poor viewing angles. If you're not sat right in front & …Beware this TV has poor viewing angles. If you're not sat right in front & in line, you'll see picture go quite dark & uneven lighting across TV. Some motion blur on 4k too - Returned mine. I saw this yesterday too watching football on BBC HD in Currys. the players had a shimmer when they moved.. maybe the internet stream wasn't good.. but didn't sell it to me. I saw this yesterday too watching football on BBC HD in Currys. the …I saw this yesterday too watching football on BBC HD in Currys. the players had a shimmer when they moved.. maybe the internet stream wasn't good.. but didn't sell it to me. They have inherent problem with viewing angles & slight motion blur. Strange it says it an IPS so should have the best viewing angle?